With the onset of spring in New York State, most drivers can expect the winter chill to (eventually) recede. In its place, drivers experience less icy roads and longer daylight hours, all of which contribute to safer roads. According to 10 years of DMV data, April is the safest month for driving in the state. From 2009 to 2018, an average of 7.05% of all traffic accidents for any given year took place in April. This is the lowest percentage of accidents for any month during the 10-year period of data available. 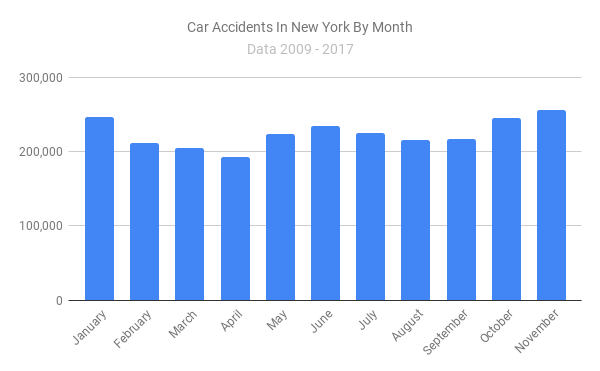 Preliminary data on 2018 crashes shows there were 21,466 accidents on New York State roadways in April. Only December of last year had fewer accidents (19,406), although in prior years December often features a greater proportion of crashes. Overall data showed a consistent dip around the spring timeframe. But this dip does not last! The number of crashes each month rises steadily in May each year and peaks briefly in June as the weather warms up. Crashes in July and August average just a bit below June. In addition to the shift in weather and longer daylight hours, another potential contributing factor to safer roads in April most years is a slight uptick in police enforcement during the early part of spring. 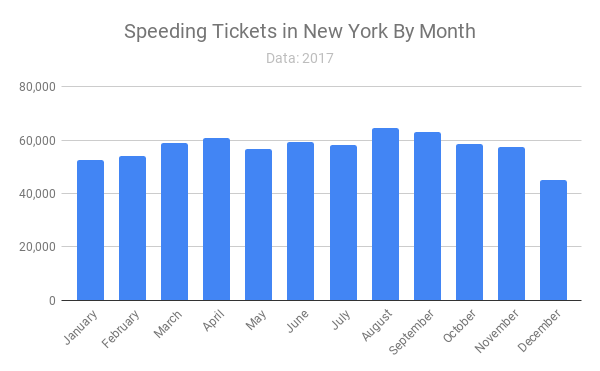 In 2017, police in New York State issued more than 60,000 speeding tickets, several thousand more in the winter months that preceded it and those which follow. Past years were similar, although less consistently. 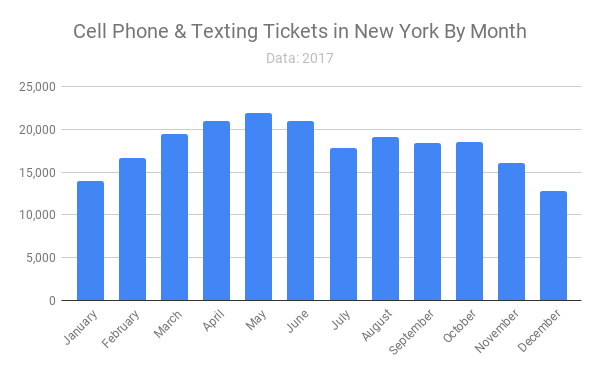 A similar trend is observable with texting while driving and cell phone tickets. The bottom line: April is a low month for accidents but a higher month for traffic tickets. Drivers out on the road should be cautious and obey traffic laws.